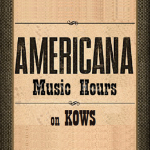 Introducing Blue Moon Americana’s new hours on kows.fm/listen on weekday mornings at 6am Pacific. Dave Stroud sits in at 8am to introduce the new show by an expanded, curated episode featuring new music from Buddy Miller, Luther Dickinson, and David Thom/Don Rigsby. He’s also got a set of vintage Gram Parsons and The Byrds…with all the usual suspects. A special version of The Americana Hours this week while Blue Moon takes a week off at KWTF.